Your moisturizer's formula and how you applyi t can make a H-U-G-E difference in how your skin will look. So if you find that your complexion is looking extra greasy early in the day, or feeling super dehydrated, it could be because you've committed one of these moisturizing mistakes! You don't moisturize because you already have oily skin. You use the wrong formula for your skin type. By far the most common one: If you have oily skin and are using a heavy moisturizer, ofc you'll instantly look shiny. Find the right formula by talking to a dermatologist to figure out your skin type. Or if you're on a budget, sales associates can also help you out and recommend products to you! You apply too much product. No matter what your skin type is, if you pile on your moisturizer like there's no tomorrow, your complexion will end up feeling slippery and oily. Avoid OD-ing on face cream by following your moisturizer's application instructions. If there aren't any, a good pea-sized amount will do for the whole face! You don't apply it on your neck and chest area. FYI, the skin on your neck and chest ages, too. According to Skincare.com, gently massaging those two areas with your moisturizer will prevent premature lines from forming. You apply it on dry skin. If you notice your moisturizer taking a while before it fully sinks into your skin, it may be because you're applying it on a dry complexion. We recommend that after cleansing your skin, leave it a little damp before going in with your cream, or you can prep it with a toner. The slight wetness will help the product quickly lock in moisture. 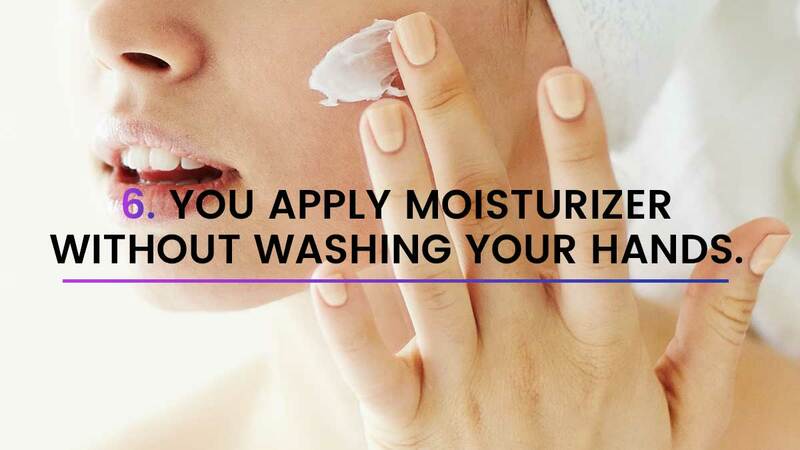 You apply moisturizer without washing your hands. We don't even want to think about how much bacteria and germs your hands and fingers have. If you want to lessen your chances of getting blemishes, thoroughly wash your hands before applying moisturizer, especially if you're dipping your digits in a jar—bacteria love damp, dark places. You don't let it dry before applying makeup. Whatever foundation you use, if your moisturizer hasn't properly sunken in, it will leave your makeup looking blotchy. The solution? Wait a few minutes before buffing on foundation, powder, and blush for a ~*flawless*~ finish.